TODAI is kicking off the second half of the year with a much-awaited return of the all-time favourite Alaskan Crab Festival. As if that is not exciting enough, fans of the international buffet restaurant can also look forward to spice things up with a Spicy Roll Eating Contest in the month of July and August. TODAI’s Spicy Roll Eating Contest is perfect should you love the combination of sushi and spice. With TODAI’s special Spicy Roll ranging from Level 1 to Level 4, test your limits and find out what level of spiciness you can actually take. Having had the opportunity to participate in this contest out of fun, thinking that the level of spiciness would be bearable, it was an outright mistake. The huge jug of iced water on the table should have been an outright hint that this contest wouldn’t be an easy one, yet I decided to give it a shot. True enough, I failed at Level 2 and even then, the burning sensation in my mouth never dissipates till half an hour later. Kudos to those who managed to successfully complete till Level 4. To all spicy lovers out there, do take up this challenge because as long as you finish until Level 4, you walk away with TODAI dining vouchers. Sounds just awesome, right? The Spicy Roll Eating Contest is held every weekday during the month of July and August. Contest starts at 1230pm for lunch and at 730pm for dinner. Do inform the staff should you decide to participate because spaces are limited. If the Spicy Roll Eating Contest is too hot for you to handle, sit back and treat yourself to TODAI’s Alaskan Crab Festival which will feature the much-loved King Crab, Red Crab and Snow Crab, as well as the latest addition, the Golden Crab, on different days of the week. That evening, we had the opportunity to try the King Crab and the meat was simply sweet and succulent, with each leg bigger (and longer) than your finger. Should you head down to TODAI, this is something you definitely should not miss. On thinking back, I probably ate like 3 (or was it 4 legs) that evening. 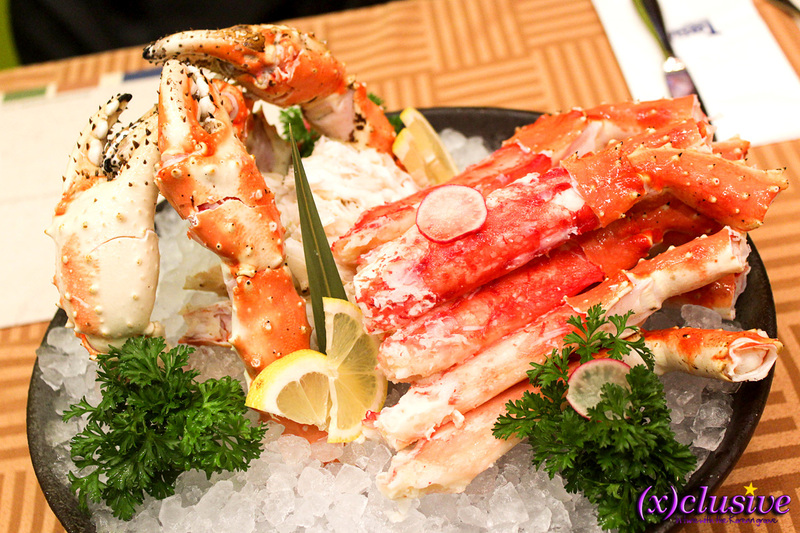 Buffet lovers who enjoyed the recent menu revamp can continue to enjoy the variety of premium crabs alongside new dishes such as half-shell scallops and whole salmon steak in the seafood section. Meat lovers can expect a generous serving of Beef Steak with Hot Brown Sauce and Lamb Chop Steak while fans of Korean food can indulge in their favourite Korean Spicy Sea Eel and the Korean Hot Paste Pork Belly BBQ in the Korean Section. For more information, do head to TODAI’s official website, Facebook page or refer to the information below. A big thank you to TODAI Singapore for inviting (x)clusive and for the great hospitality that evening. Let us end off with the Korean Celebrities who visited TODAI before – SE7EN, CNBLUE’s Jung Yong Hwa, ZE:A’s Siwan and Kwanghee, Rain, Hyun Bin and more. The Shoppes at Marina Bay Sands, #B2-01. Music Matters Live returns this year with extensive list of Korean music artists like Lena Park, M.I.B, SPICA and more! I used to be suggested this boog bby waay oof my cousin. I’m now not sure whetyher this put up is written by way of him as nobody else understand such precise about my problem.